Photographs by Raymond Meeks. Poetry by Rick Bass and Forrest Gander. Nazraeli Press, Tucson, 2004. 68 pp., 60 duotone illustrations, 10x11¼". "Meeks' photographic images, steeped in warm, lush brown tones and bathed in a nineteenth century light, seem to fall into our laps from a distant era, beyond that of our parents and their fading Kodachromes, and back further yet to an era of Civil War tintypes and twice-a-lifetime portraits. 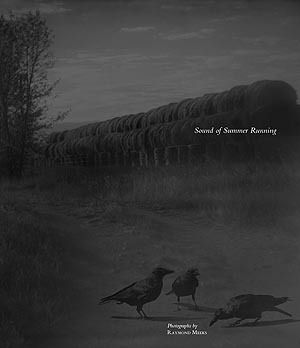 At it's core, Sound of Summer Running is a celebration of family relationships; father and daughter, siblings, husband and wife. It is a broad portrait of the joys of Summer and the ease which settles over family life during those times. Baby 'gators float in a gallon size pickle jar, children on bicycles fly by, rotten apples are chucked as far as they can be thrown into the back lot, the family German Shepherd standing on guard over all his charges. The insightful poetry by Forrest Gander, printed and bound separately and laid into the back of the book, captures perfectly those fleeting days and our inevitable desire to somehow freeze them, impossible though that may be. 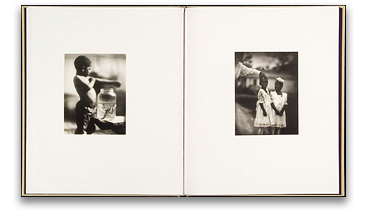 "- Darius Himes, photo-eye Booklist Editor. Edition of 50. The print size is 7.5 x 6 inches. Raymond Meeks is represented by photo-eye Gallery. See his work here. TR164-LTD Limited Edition is no longer available.